The Legend of Zelda turns 30 this year, and Nintendo has its own plans in place to celebrate this momentous milestone. 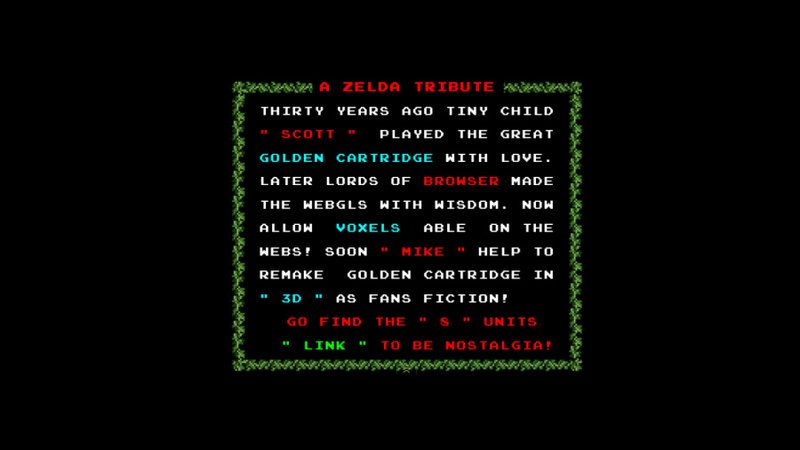 However, some fans have the same idea, such as "Scott" and "Mike", the mysterious guys behind an amazing browser-based replication of the title that started it all on the Famicom / NES. 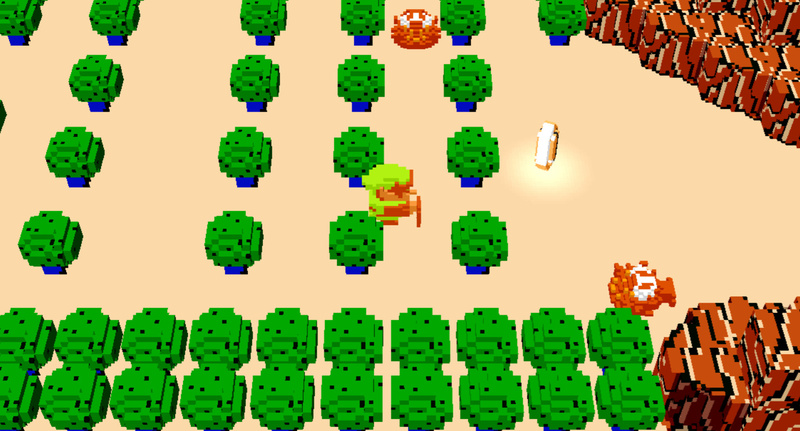 Visiting www.zelda30tribute.com reveals a voxel-based adaptation of the 8-bit classic, built entirely in WebGL. You can play either using the on-screen buttons or your keyboard. It's an impressive feat, but how long will Nintendo allow it to remain online? Let us know what you think of the project by posting a comment. Very cool lookin'. Pullin' it up in my browser now. Better than the original! Is there any sound? I can't hear anything even if my volume us up. Really impressive. These fan tributes always highlight Nintendo's lack of pace in revisiting their back catologue. Hopefully the NX will mark a change in how they approach all the IP. I'm not interested in just buying another emulation. Things like this should be downloadable, to save it from being pulled by any possible legal action. The same was done with the Mario64 demo made in Unity, which I can still play because I have it on my PC now. @LegendOfPokemon Yeah, I just had a thing saying there was a plugin error, so I have no sound as well. Where's my 3d classics version of about 25 to 50 worthy nintendo titles? I would buy many many nes games if given that treatment. Just hand them over to Sega as they seem to be doing a fine job with their line of classics!! Really cool! I would really like to see Nintendo work on their 8 bit catalogue through this so it would have the tight controls and the Nintendo Seal of refinement. @LegendOfPokemon Sounds works for me, I'm running Chrome. It seems Nintendo Life reports a lot on illegal activities, and it has been steadily growing the last couple of years. Why do you report on it as "a 3D Classics version" when it is nothing at all like the "3D Classics" series, apart from the fact it is a new version of an old game? I can see where 3D dot game heroes got their inspiration. @Spoony_Tech Sega didn't make their 3D remakes, M2 did. It runs really slow on my PC . It's rather impressive that this game runs well even on a smartphone. NICE! But I want to download it for when N makes them take it down. Can we can such a version? Nice. Just played through the first dungeon. @SaKo That's not part of Sega? @Spoony_Tech Nope. They remake old games and make emulators for lots of different game companies, including Nintendo. I fired it up for a couple minutes (didn't have a lot of time) and really enjoyed it. Hopefully the inevitable C&D takes some time to appear. 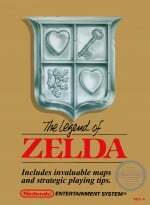 Off topic but I noticed in the article this celebrates Zelda's 30th anniversary. I wonder if Nintendo does indeed plan to release NX this year to usher in the new Zelda on NX and Wii U a like. This will get a C & D order post haste now that it's all over the gaming web sites. This looks awesome!! Great job! Makes me want to buy it again. That was a great Zelda tribute. This site IS called Nintendo Life! Illegal or not, they should report it. @AVahne I actually meant that the people that made 3D dot game heroes probably did this exact thing and then were like "Hey let's make our own game instead"
Neat. Not too sure if I'll play it for more than five minutes, but it's neat nonetheless. Sound works find for me on Safari 9.1 on OSX 10.9.5. That is amazing. I wish that I could download it. Anyone know if you can make it full screen? It's not pulling my graphics card out of idle clock speeds and as such runs at only 15 FPS or so. In being a complete recreation, it might get to stay up. So true. I'ts kinda strange how NLife censors its own users' comments yet frequently reports on egregious ripoffs of Nintendo IP. It's a nicely done project. I dream of this game being remade with the A Link Between Worlds engine. Cool, just tried it on my phone, but it's pretty unplayable using touchscreen controls. Looks neat though! I doubt Nintendo will allow this to stay online for very long. This is a lot of fun. Still needs work but I'm really hoping the developer gets to finish it. Holy smokes! This is a beautiful ode to the original Zelda. Love it. Nintendo asked us to remove this site for copyright infringement. I guess Zelda30Tribute was a little too pixel perfect We're sad about that, but we get it. We started this project because we love Nintendo and the joy they have given us throughout the years. From the start of development, we knew this result could potentially happen. Nintendo has every right to protect their IP. No complaints from us, we had a blast working on this tribute and made some friends along the way. Big thanks to the half million folks who played our game! We learned a bunch and wrote some code that others might learn from, too. We plan to post the project to Github soon, once we've had a chance to remove Nintendo-owned assets. We both have future software projects in the works. If you would like to keep in touch, please follow us on social media or join our mailing list. We'll let you know! This was not the greatest game in the world, no. This was just a tribute. Thank you Nintendo for the inspiration! Nintendo should just straight-up look into this kind of thing. That game was pretty great like that. I'm glad that I got to play this a little before the takedown notice. The only two issues I had with it were the questionable hit detection, plus a Zora surfaced on land once, lol.